Paul Hollywood’s Cheddar and Chive Scones | I Wanna Bake! As I mentioned back in January, I’ve recently come into a new wealth of cookbooks written by the hosts of the Great British Bake Off thanks to my thoughtful in-laws. I’m planning on trying and posting at least one recipe from each new book, and so far I’ve written about Mary Berry’s date and walnut sheet cake (there will probably end up being several recipes from each book, but one each is a good starting point, right?). 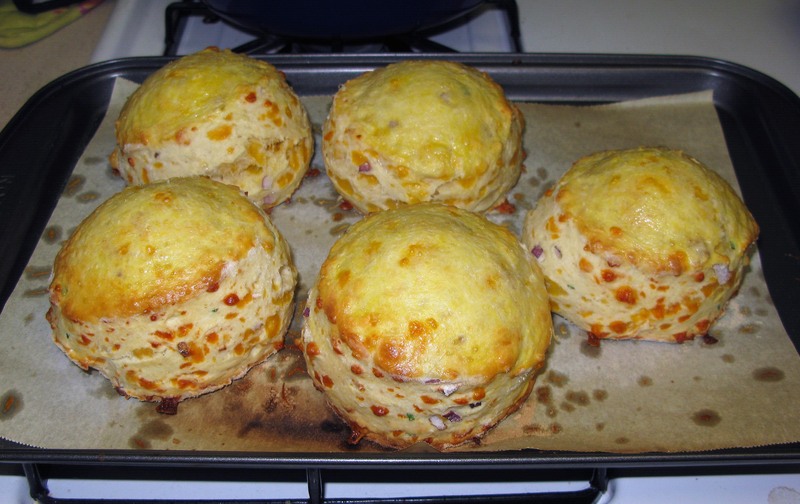 This week, I bring you Paul Hollywood’s cheddar and chive scones from Paul Hollywood’s British Baking. First off, I’m using Paul’s terminology here, but I’m pretty sure any American would call these biscuits. 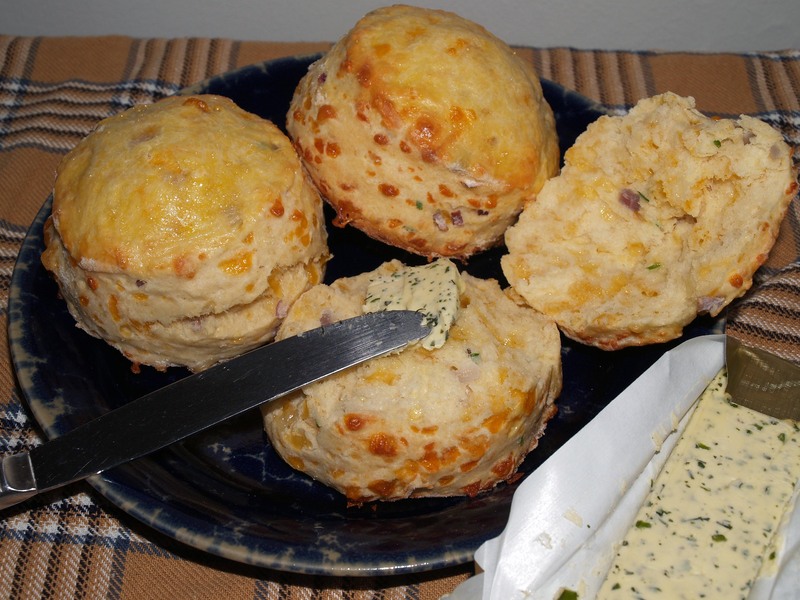 In fact, they are suspiciously similar to Red Lobster’s Cheddar Bay biscuits (same general flavor, but more uniform in shape and less crumbly). I suspect that if you made these with buttermilk, they’d be even more recognizable as an American biscuit. Regardless of what you want to call them, these are DELICIOUS. Seriously, I can’t get enough of these scones/biscuits (sconscuits?). Usually I’ll make a recipe for blogging once, then not have a chance to revisit it because I’m too busy trying other things while also trying not to develop a stockpile of baked goods that no two humans could ever hope to get through. I’ve made these scones three times so far. That means I’ve liked them enough to decide that I need a constant supply ready and waiting in the freezer at all times. Aside from one minor change, I tried the recipe as written the first time and made only minor changes in subsequent batches as well, and it really left nothing to be desired. 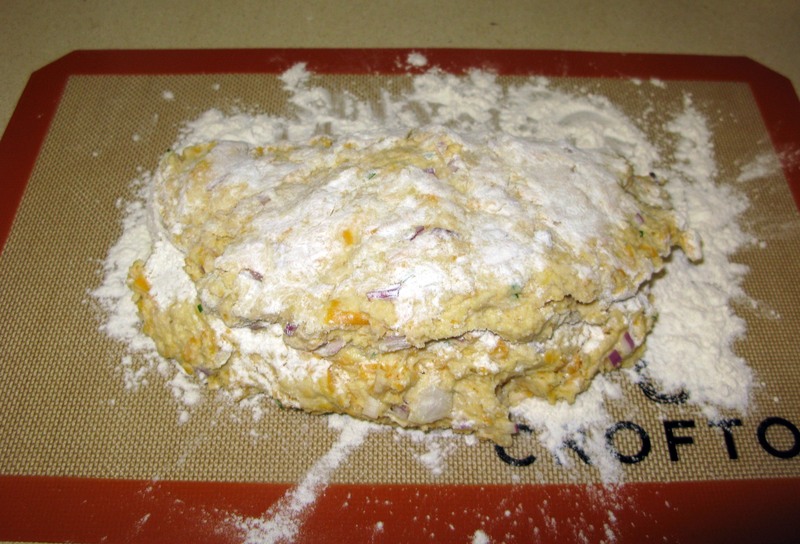 The original recipe instructs you to add all of the scone ingredients (wet and dry) to the flour/butter mixture at once, but I decided to toss the dry ingredients in first for better distribution, then stir in the wet ingredients. 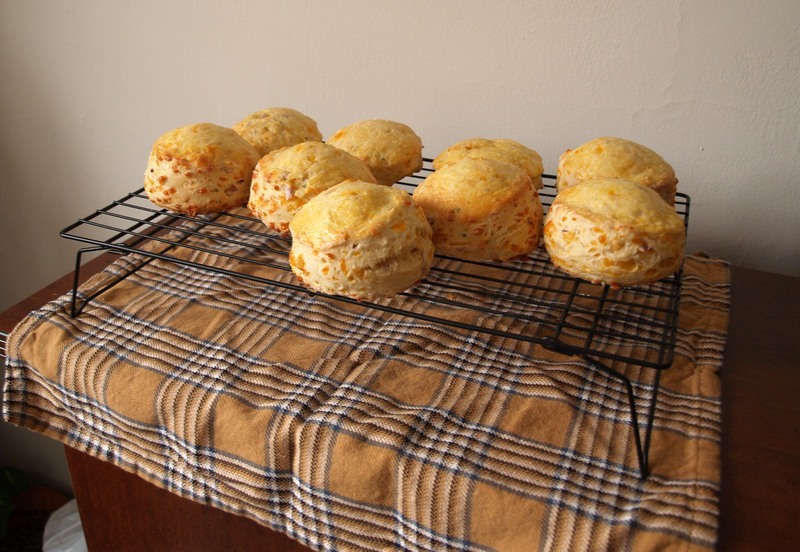 For my second and third batches, I switched to double Gloucester cheese because it’s my favorite, but regular cheddar is just as good. I also tried using a shallot instead of regular red onion, and it worked reasonably well. I’d say use whichever is easier to get your hands on, because I don’t think there’s really a noticeable difference in flavor. Once again, I’ve Americanized the ingredients and temperatures for this recipe. 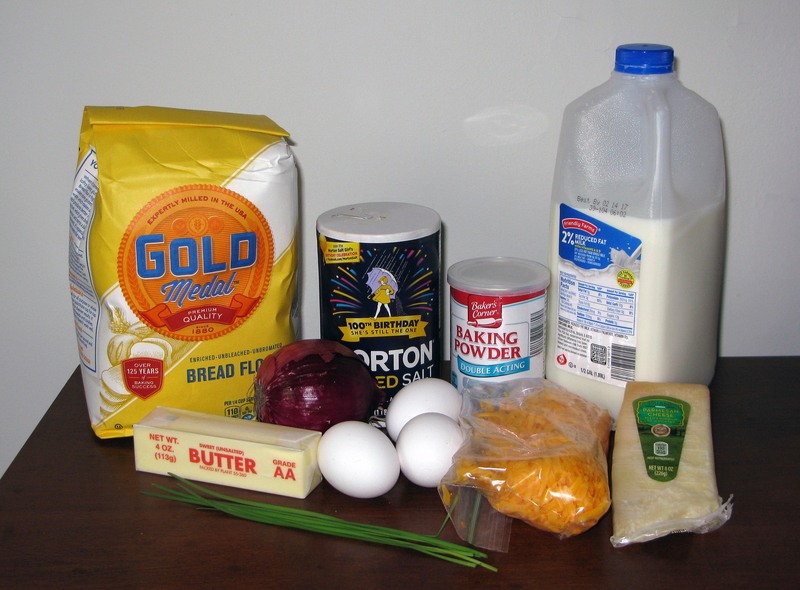 However, if you have a kitchen scale, I’d recommend measuring by weight for all ingredients that have weights listed. Sometimes the conversion makes for a messy measurement, so I’ve left included some measurements in grams where that happens. These scones are best fresh out of the oven with some salted or compound butter, but they freeze quite well too. I freeze any that aren’t eaten on the first day on a plate, then transfer them to freezer bags when they are frozen solid. To defrost them, all you have to do is wrap them in a napkin or paper towel and microwave them for 45-60 seconds, depending on your microwave’s power (mine is a bit low, and I find that a minute is the perfect amount of time). They’re not quite the same as they are fresh, but the difference is barely noticeable. I like to eat them for breakfast with a microwaveable sausage patty and a slice of American cheese. Perhaps not the most healthy breakfast, but it certainly is satisfying (I guess I’m not really past Comfort Food Month yet). This recipe aside, the book itself is pretty and fun to just sit and read. It’s divided into UK locales, and the recipes are sorted based on where they originated. These scones are from the Scotland section (I will admit that my recent fixation with the Outlander books got me to read that section first, but these scones held an appeal all on their own). My husband and I have been snickering about some of the overly-serious photos (I mean, look no further than the cover to see him as the British forefather of Salt Bae), but that is really just nitpicking. The writing is surprisingly down-to-earth for a celebrity chef, the recipes are great, and there are helpful photos scattered throughout. If you like this recipe as much as I do, or if you’re interested in learning more about British culture through food, I’d definitely recommend picking up a copy of this cookbook. Preheat your oven to 425°F and line two cookie sheets with parchment paper. Set aside. Cut the butter into ¼”-½” cubes and chop the red onion or shallot. Set the onion aside. In a large mixing bowl, work the butter into 3 cups (450 g) of the flour until it resembles coarse breadcrumbs. 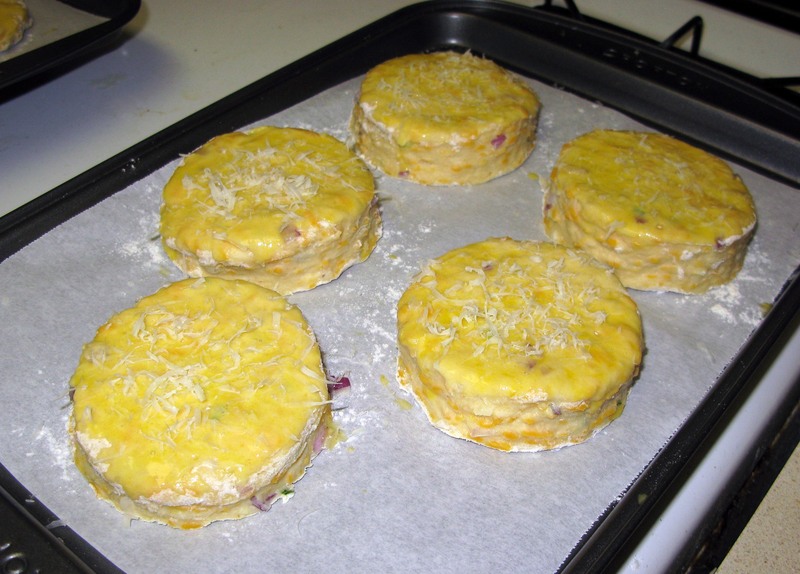 Add the grated cheese, red onion/shallot, chives, baking powder, and salt and toss well to combine. Stir in the eggs and milk until a sticky dough forms. 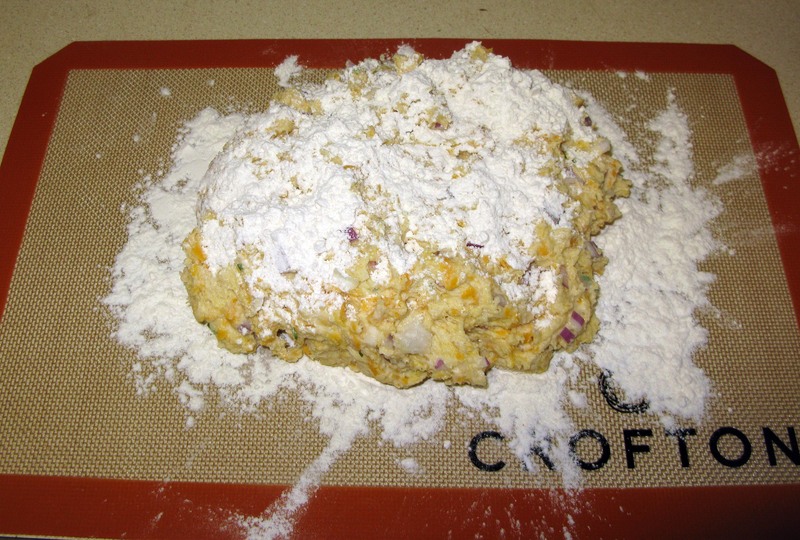 Sprinkle approximately half of the remaining ⅓ cup of flour on your work surface and turn the dough out on top of it. 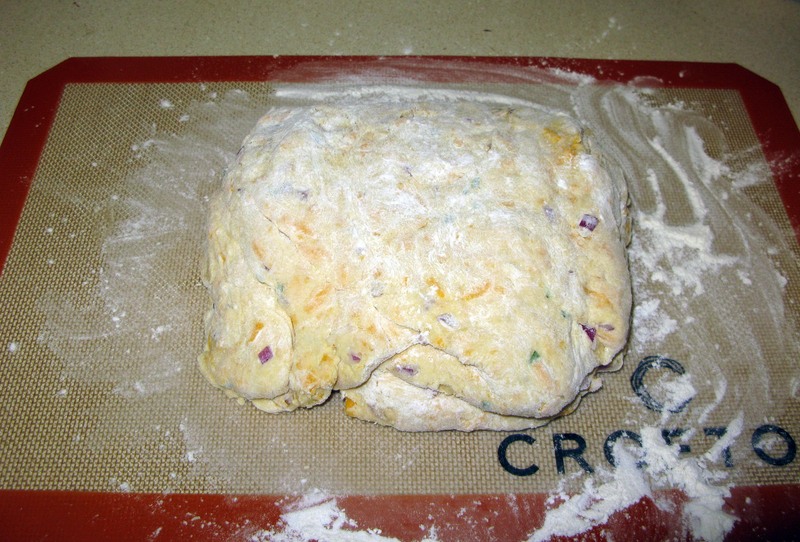 Sprinkle the remaining flour on top. 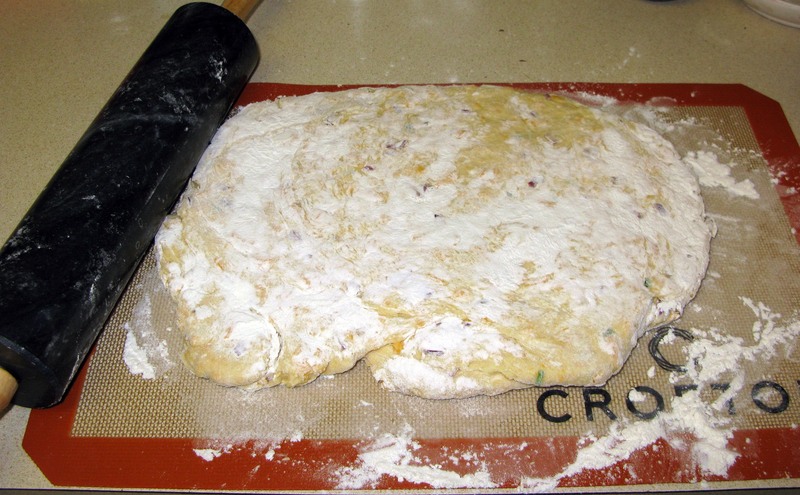 Fold the dough in half, top to bottom, and press down gently to flatten it a little. Repeat the folding/pressing/rotating process until just about all of the flour is incorporated into the dough. 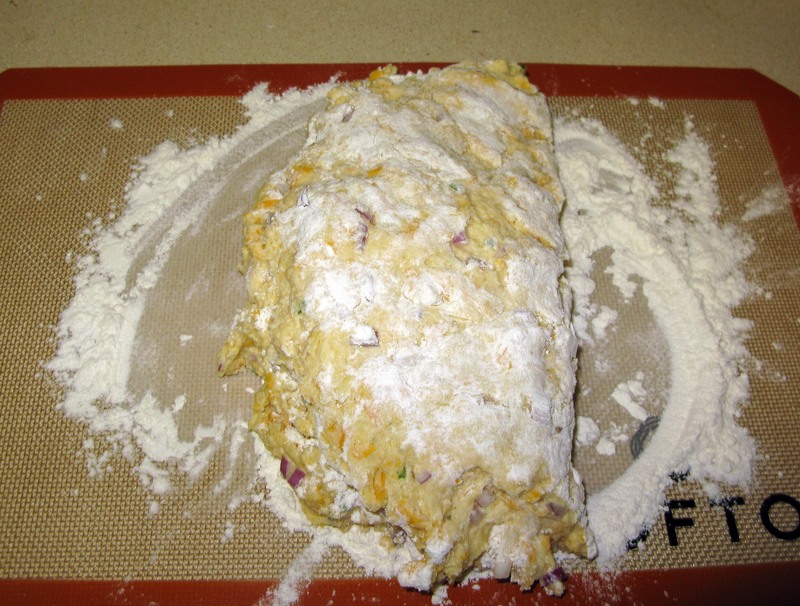 Roll the dough out to approximately 1″ thick. 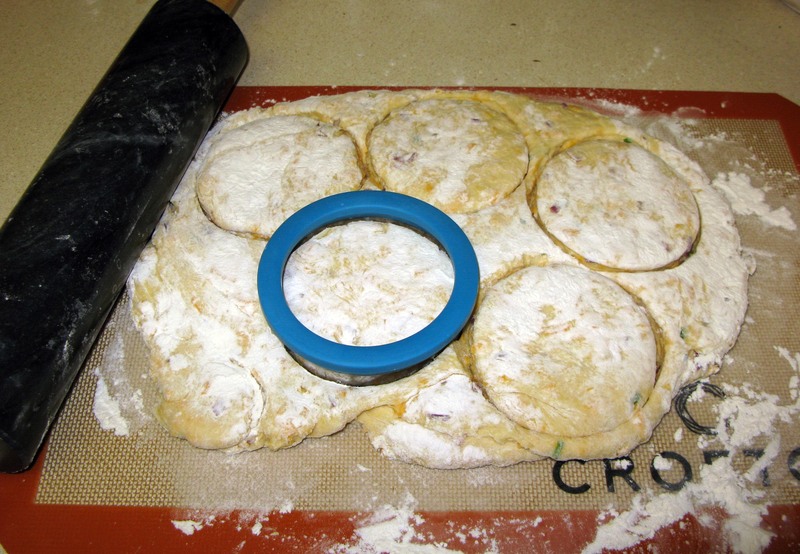 Using a 3″ round cookie cutter, cut out scones WITHOUT twisting the cutter (this will make them rise unevenly). Pull the excess dough away from the cut scones and transfer them to the parchment-lined cookie sheets. 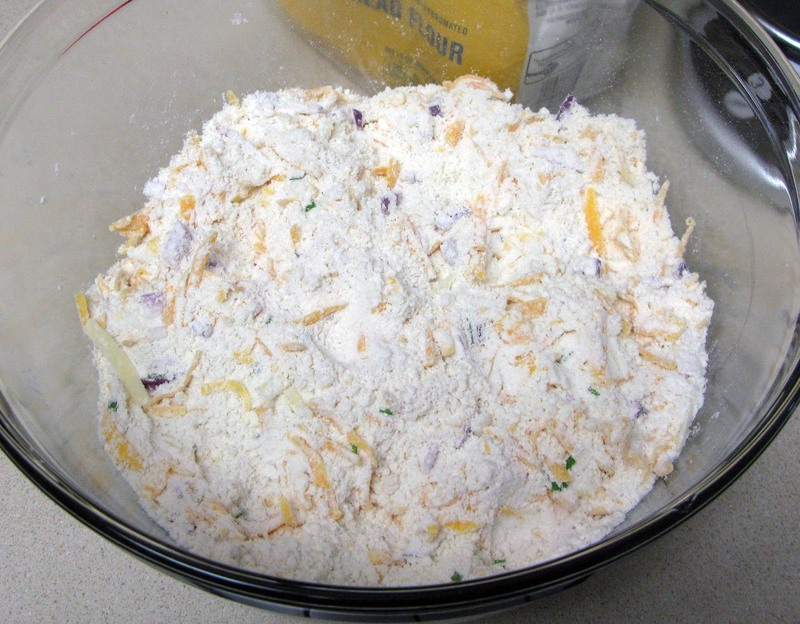 Gather the dough scraps, kneading just enough to make them come back together, re-roll, and cut until all of the dough is used up. 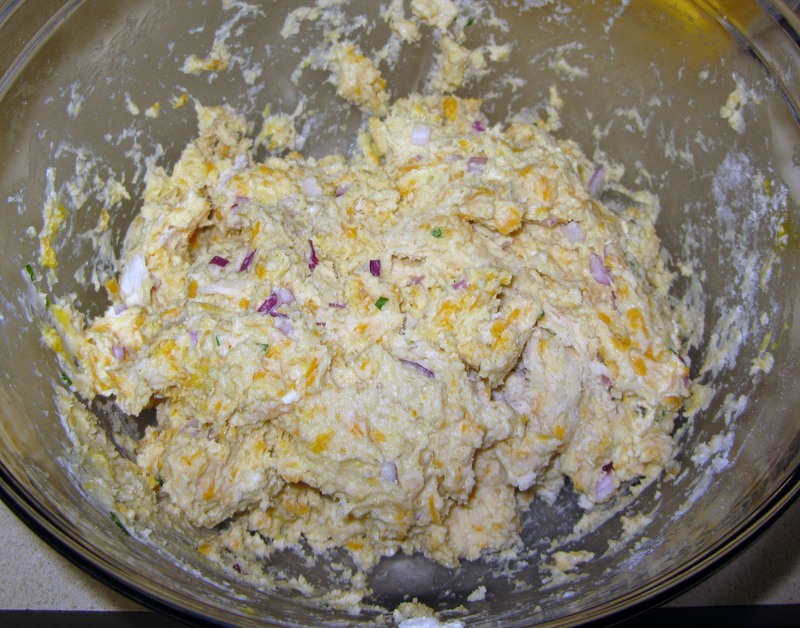 Beat the remaining egg in a small bowl (you can add about a tablespoon of water to make it easier) and brush the tops of the scones with egg. Wipe up any drops of egg on the parchment paper so that they don’t burn. Grate Parmesan cheese on top of the egg wash.
Bake for about 15 minutes, or until the scones have risen and the tops are golden brown. Transfer to a cooling rack to cool just long enough to handle. Serve warm with salted or compound butter. 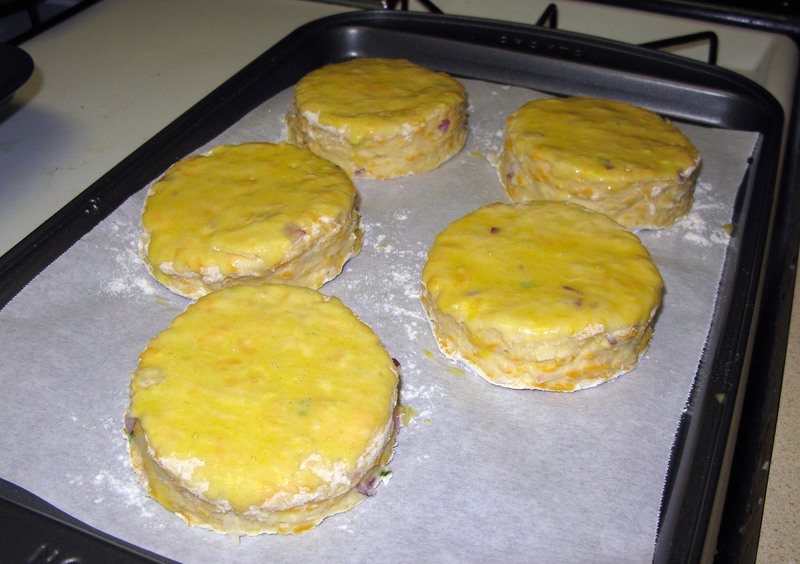 Freeze leftovers and reheat in the microwave as needed.